As your embedded project grows in scope and complexity, power consumption becomes an ever more apparent issue. As power consumption increases, components like linear voltage regulators can heat up during normal operation. Some heat is okay, however when things get too hot, the performance of the linear regulator suffers. A good rule of thumb for voltage regulators is if the outer case becomes uncomfortable to the touch, then the part needs to have an efficient way to transfer the heat to another medium. A good way to do this is to add a heat sink as shown below. A heat sink attached to a linear voltage regulator on the Breadboard Power Supply. A heat sink is often times just a big hunk of metal that helps pull heat from the part under load. By increasing the surface area of the heat sink, more of the heat is exposed to cooler air, thus cooling the part more efficiently. This is why you see "fins" on some heat sinks, as shown in the above picture. If you use a heat sink, it is a good idea to add heat sink compound or thermal tape to the physical contact area between the voltage regulator and heat sink. The heat sink compound or tape allows for proper heat transfer from the voltage regulator to the heat sink. You can see the white heat sink compound in the picture above. Remember you only need a tiny amount! Your layout can also use copper planes as heat sinks. Sometimes the copper pours on PCBs are used as heat sinks. 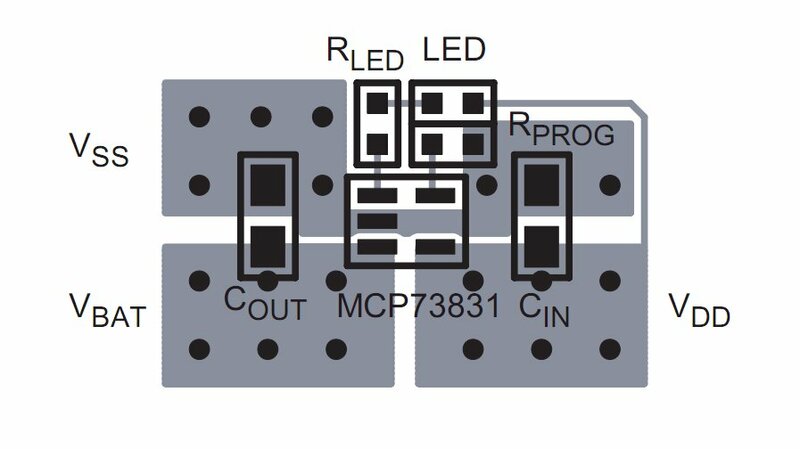 In the above picture, the MCP73831 LiPo battery charging IC needs to dissipate heat on the PCB. The gray areas are copper planes and the black dots are vias (copper-plated holes to the bottom layer). All of this copper amounts to a greater area of radiative thermal mass, which will efficiently dissipate heat to the outside air. 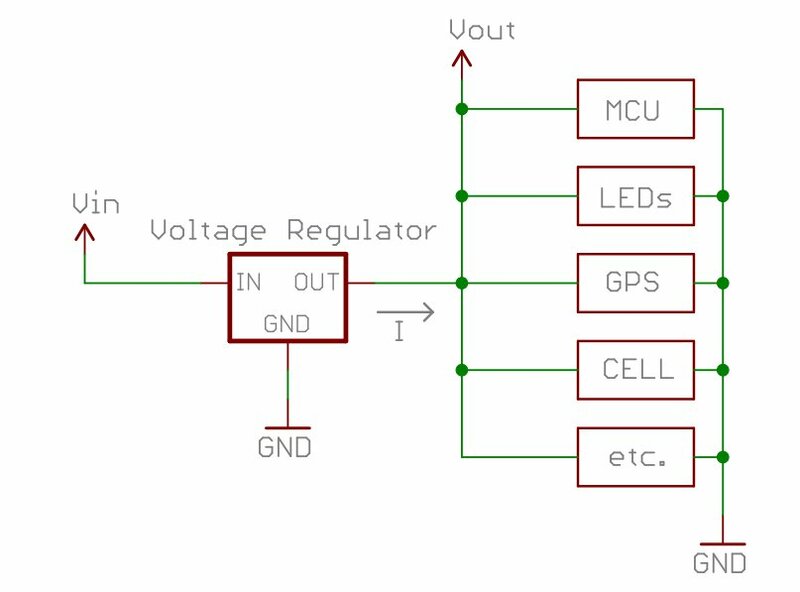 Why is the voltage regulator heating up? For this brief discussion we will talk about linear regulators (compared to SMPS). 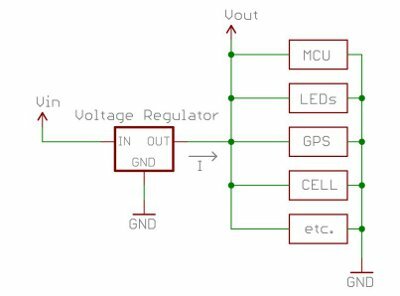 The efficiency of a linear regulator depends on the difference between the input and output voltages and how much current is being drawn by your circuit. The greater the difference between input and output voltage or the greater the current, the more heat will be dissipated by the regulator. This means linear power regulators are not very efficient at regulating voltage, since so much energy is wasted as heat! Switched mode power supplies (SMPS) are much more efficient and are becoming more common, however they can be difficult to use since they sometimes are susceptible to generating noise if not used correctly. We can calculate the average amount of power a regulator will dissipate, which is directly related to the heat generated by the regulator. Vin, the voltage on the input of the regulator. Vout, the output of the regulator and the voltage that is used to power the external devices. I, the maximum amount of current the system can draw. Add up the specified (RTFM) maximum current draw from all of the devices (MCU, GPS, LEDs, etc) for a safe estimate. We can now use use the power equation and plug in three values to calculate the power used by the regulator. Vin. Let's say we are using a fully charged 9V battery. Vout. In our example, it is 5V. I. Let's assume the maximum current draw from all of the devices is 2.5 Amps. 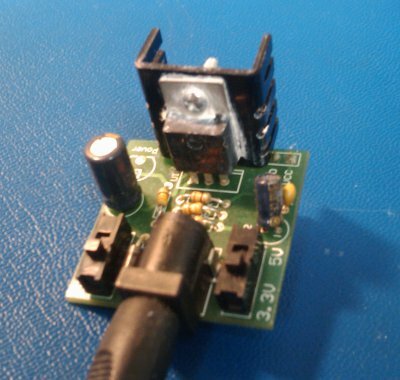 10 Watts is a lot of energy to be dissipated through a small electronic component! This is why heat sinks may need to be used with linear voltage regulators. An important point to keep in mind: Our calculation can be considered the peak power dissipation of the regulator, because in reality, the system does not draw 2.5 Amps, continuously. The MCU, GPS, and CELL modules generally pulse with current which averages out to a much lower value. But it is always a good idea to assume worst-case-scenario values! "Thermal mass" is the wrong term. "Radiative (or dissipative) area" is much better. Using a near-ideal large thermal mass (e.g., a thermos full of water) for a heat sink will result in a device which takes a very long time to overheat, but will still do so regardless of the size of the thermal mass. A dissipative or radiative area provides the capacity to get rid of heat to the environment, rather than store it. I believe the correct term is "thermal conductivity". The thermal conductivity of a part is measured in Watts per Kelvin. Adding a heat sink to a part provides a low-thermal-resistance path to a larger surface area of air, which allows more Watts of heat dissipation per Kelvin of temperature difference between the part and the surrounding air. If you know the thermal conductivity from your part to the air, you can even calculate the exact temperature it will heat up to! For these purposes, the air is regarded as having nearly infinite heat capacity, just as the ground is regarded as a nearly infinite reservoir of charge. Thanks for pointing that out. Thermal mass is the incorrect term for radiative heat sinks, I made some changes above. However, the thermal mass (or specific heat capacity) of the heat sink does play a part in how efficiently the heat from the part is transferred to the heat sink, but for the sake of this "bite-size" tutorial, we will not go there. Newbe question: When I'm looking at a device's datasheet how do I find the: "maximum current draw"? For example when I'm looking at my MCU datasheet it says "Max current sourced by ports: 200mA, Max current sunk by ports: 200mA, Max output current sunk/sourced by I/O pin: 25mA,etc" Should I select the 200mA or add both the sourced & sunk or do I add up all the i/o pins (25mA) that are currently in use? I want to clearly understand how much current to use in the power equation. Thank you in advance! This is a good example of whether to design for the worst case or for average use. In a situation where failure is not an option (NASA, etc.) you'll want enough heatsink to provide for every pin working at its maximum capacity. But far more often, especially if your project already has a well-defined purpose, you can get away with adding up the power dissipation of the MCU at the speed you're running at, plus all the outputs (LEDs, etc.) that you'd expect to use in an average situation. The decision is up to you, but either way, you're on the right track. Good luck! Question? How when Vout is 5 volts can you take the difference 4 and figure your watts? If Vout is 5 volts then it should be 5 x 2.5 which equals 12 watts. Obiviously I am missing something if the formula is correct. I could see 9Vin-4V(Regulator drop)=5Vout x 2.5 = 12 Watts?????????????? I believe that would be the power dissipated through the regulator. Take a 78L05 regulator for example (5 Vout at 100 ma). So referencing the datasheet you would need at least 7.2 V in to to drive at output of 5 V. So your output power will be 5V x 0.1A = 0.5W and your power dissipated will be (7.2-5)V x 0.1 A = 0.22W. To drive that output you would need an input supply that could source at least 0.72 Watts (0.5+0.22) with an input voltage of at least 7.2V (regulator minimum Vin). 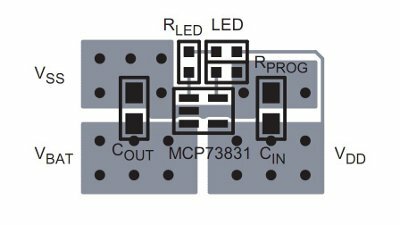 A lot of datasheets will give you a Power Dissipated value Pd in watts. In this case (78L05) its actually internally limited. But Pd = 0.22W for this scenario. And what would u say if a regulator with heat sink, still gets too hot to touch? in my circuit, i get about 20-21V from a power supply, to a 12V regulator and the 12V are fed to a 5V regulator. I would say you should switch from a linear regulator to a higher efficiency switching regulator. More efficiency = less power loss = less heat. Well, I'd say "ouch", of course! I think this article needs to be revised..
1) Like Kli mentioned, I don't think thermal mass has anything to do with this. 2) You left out thermal resistance, which is the single most important aspect of choosing a heatsink. You left out thermal resistance, which is the single most important aspect of choosing a heatsink. Yea, we left out why the heat sink gets warm and how to choose a good heat sink, along with many other concepts from this bit-sized tutorial. The goal was to hit on a couple of concepts to keep it short, but feel free to add as much as you want to the comments!